Getting a good night’s sleep is all about being comfortable. However, it can be hard to get comfortable if the mattress you’re sleeping on gets excessively warm. While finding a cool sleeping surface has been a priority for generations, it’s only with the recent assent of memory foam and other foam mattresses that so much attention has been paid to ways to keep a mattress cool. This guide will help you understand the various factors in play when it comes to keeping a mattress cool. We’ll go over the different types of mattresses in terms of their cooling abilities, followed by a discussion of the role of the mattress cover. Finally, we’ll list some of the best cooling mattresses so you can take your exploration to the next level. We’ve listed the different types of mattresses in order from the coolest to the warmest. The biggest factor for how cool a mattress sleeps is airflow. The amount of airflow a mattress has determines how much heat can be carried away at a given time. Airflow is also the main factor that the secondary factors like surface area and chemical properties rely on. Very much like the nicest sports car in the world can’t do anything without gas, none of the other factors that deal with heat and cooling function without airflow. Aside from airflow, the surface area of a material plays a large role in how much heat it can move. The more surface area something has, the more of it is exposed to the moving air. Therefore, materials with more surface area do a better job of keeping cool than materials that are tighter and more compact. Chemical properties also play an important role in keeping a mattress cool. All materials have different thermodynamic properties. One of those proprieties is how much heat a certain substance can retain. Therefore, using materials that absorb less heat helps to keep the mattress cooler. We’ll see some examples of this in a moment. Coil and innerspring mattresses sleep cooler than any other kind of mattress. If we keep in mind that airflow is the primary determining factor for how cool a mattress is, then this makes a great deal of sense. Innerspring and coil mattresses have huge empty air channels between and around the coils or springs, so they can move a great deal of air through the comfort layers of the mattress. This level of airflow makes them the coolest mattresses around. Latex foam is an increasingly popular mattress material. It offers many qualities similar to the qualities of memory foam, but carries some important distinctions First of all, latex naturally has more pockets of air in it than most types of memory foam. 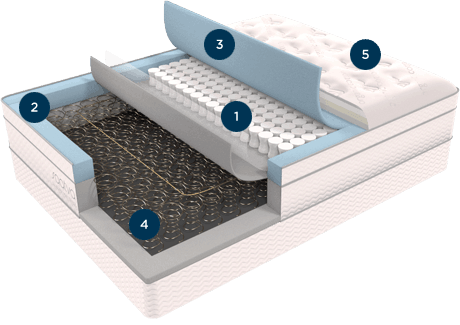 This higher number of air pockets and channels increases the ability of air to move through the mattress, and also increases the surface area of the material exposed to the air. Latex also has chemical properties that cause it to be a cooler mattress. Latex simply can’t hold as much heat as the poly foams used in memory foam construction. This means that it will have a lower maximum temperature, helping it to stay cool. The next type of construction we’ll talk about has to do with gels. Gel is an increasingly popular addition to memory foam mattresses because of how much it helps with the cooling process. 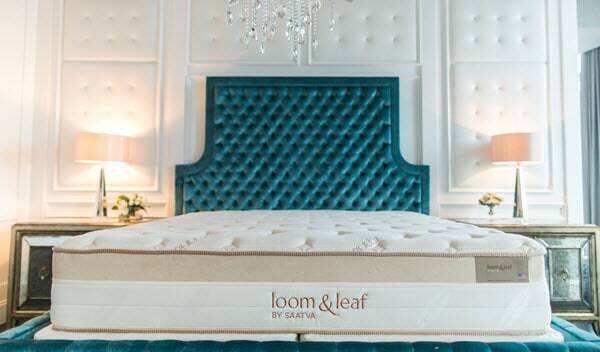 The result of the innovations made with gel is that you can now find memory foam mattresses that don’t sleep noticeably hotter than a traditional innerspring mattress. Gel can be incorporated into a mattress a few different ways. One of the earliest methods was to mix gel beds into the foam while it was being made. This allowed the gel to be evenly distributed throughout the foam. Gel beads are still being used, but mattress companies are increasingly using a swirl method to distribute gel through the foam. The principal behind this works the same as with gel beads, but allows a greater amount of the gel to be exposed to the air, increasing its surface area. The increased surface area is important because it complements the chemical properties of the gel. Gel, like latex, holds less heat than memory foam does. Therefore, the combination of more gel exposure and a lower maximum temperature means gel mattresses sleep cooler. Foam mattresses sleep hottest out of the most common mattress materials. They have chemical properties that hold more heat, and the contour and hug that so many people love from a foam mattress mean that less of the foam is exposed to the air. As a result, the foam traps more heat. The mattress cover is frequently under-appreciated. After all, it spends most of its life hidden under sheets. However, because of the vital role that airflow plays with mattress cooling, having the right cover can mean the difference between a cool night’s rest and a hot sleeping surface. Quilted covers generally result in more material around your body. That means more material blocking the flow of air, so more heat. They are favored by many sleepers for their sharp look and soft, comfortable feel, but memory foam mattresses don’t use them as much as traditional mattresses. Celliant – a thermos-reactive fabric that transforms body heat into infrared light. There are studies that indicate IR light improves blood oxygenation, which in turn allows for better temperature regulation. Lycra – the fabric that most high-performance athletic clothes are made from, it does a phenomenal job of wicking moisture and keeping your body cool and dry. Performance Polyester – also seen in sports clothing, particular dry-fit athletic wear, these fabrics work to wick moisture and increase the flow of air over the surface of the mattress.